Mike Bickle is a man of God and a brother in Christ. We are called to love - not criticize - our brothers and to honor men of God, whether we agree with how they do things or not. If you're coming to this page in order to criticize or to exercise a religious spirit, please ask yourself: "Does my attitude honor God? Does it bring unity or disunity in the Church?" and if appropriate, please repent as necessary. This page has been linked from a website whose main activity is criticizing and mocking men and women whose love for God is different than their own. They have linked this page for the purpose of mocking Mike and defending their own self-righteousness. Those who gossip about the Bride whom Jesus madly loves are not likely to find Him very happy about their "ministry." I would hate to be in those shoes when standing before Him as my Judge. O. The "now" word of God must be confirmed with power. The only way to be culturally relevant in society is to move in power to confirm the Word. Without this, many in the Church are looking for ministries with trendy language and clothes, interesting technology, or to talk about current affairs to identify together. Many are trapped in an abyss of entertainment. B. Christ defeated Satan at the cross. However, the full scope of His victory has not yet been fully manifested on earth. At Christ's ascension, Jesus was seated at God’s right hand, far above all authority (Eph. 1:20-22). Jesus disarmed the demonic powers and made a public spectacle of them (Col. 2:15). The "already and not yet" paradox of the Kingdom is now operating. I knew there were prophetic words speaking about our recent unusually snowy winter. I've been waiting for them. November 1, 2008 when we took a team to Wenatchee to share about the Five-fold ministry I received a vision during the opening worship. The Lord showed me Pastor Mike McGrath walking through about 3 feet of snow. The Lord said that day a dozen times and again through the first part of December - "The Snow is Coming". On November first He shared an interpretation of the vision. He told us that while snow officially demonstrates that much of outside life is in hibernation, appearing to be dead. But this Spring, when it thaws, life will spring forth in incredible ways. This the Lord told us was a spiritual picture of what will take place in the spiritual realm over Washington State. This Spring life will spring forth in incredible ways. Be ready for it. While the snow is beautiful, not appreciated by everyone, it is a Sign to us from the Lord. On a personal note, when the Lord talked about the snow coming, I thought He meant Eastern Washington. Having lived here almost 20 years, I have not seen this much snow in Western Washington. This demonstrates to me that the Lord meant all of the State in His interpretation, not just part of it. We are in this together friends and our Lord has great plans for our state. I say plans because what He will do throughout our state will look different in each region. It is why it is important for all 12 regions to hold at least two Prophetic Gatherings between January 1 and April 1, 2009. Expect to hear from someone in the next couple of weeks re: the region you are in. It is going to be a great year! Enjoy your Christmas and be thankful for the sign of snow. Those of you inundated with the snow, means your area is prime for inundating spiritual blessings. They continue, saying, “Lincoln's faith was not conventional,” and go on to describe that faith as growing, but completely outside of the normal traditions of being a Christian in his day (or in ours). In fact, it was Lincoln’s new faith that led him to declare the controversial Emancipation Proclamation that abolished slavery in this nation. In other words, Abraham Lincoln entered office with not much of a living faith, but encountered God early in his term of office. There are a number of prophetic voices around this country who are praying for the same kind of experience with President Barack Obama: that early in his term of office, he would find the God whose hand has been on this nation since before her birth. These men and women are believing that this is God’s purpose for Mr. Obama. I say all of this for two reasons: first to encourage prayer for President Obama, and specifically, to encourage prayer for an Abraham Lincoln experience: that he would discover his Maker more personally over the next few years. Second, an introduction is needed for this CNN report of Mr. Obama speaking of his own “religious transformation.” This is a foundation from which to pray for that Lincoln experience for Mr. Obama. He has a start, let’s pray for a faith that drives his choices and actions to the point where Barack Obama is willing – as Abraham Lincoln was – to make politically dangerous decisions in favor of justice for the helpless, that Obama would declare with Lincoln, “It is my constant anxiety and prayer that I and this nation should be on the Lord's side.” And let’s continue to pray for Mr. Obama even if his faith, Like Lincoln’s, does not line up doctrinally or experientially with traditional orthodox Christianity. WASHINGTON (CNN) – President Barack Obama spoke out Thursday about his religious transformation. 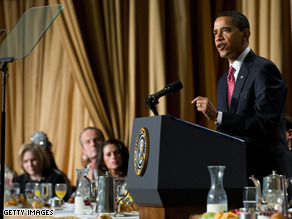 The President's comments came at the National Prayer Breakfast. “I was not raised in a particularly religious household. I had a father who was born a Muslim but became an atheist, grandparents who were non-practicing Methodists and Baptists, and a mother who was skeptical of organized religion, even as she was the kindest, most spiritual person I’ve ever known. She was the one who taught me as a child to love, and to understand, and to do unto others as I would want done. The Spirit of the Lord says hear the prophet and hear the prophets that speak from this territory from desert which carries water beneath it. They say the antelope valley had a gathering of prophets that the enemy was able to come in and disburse them. God said heaven is watching for you have caught its attention. You have caught heavens attention. Why? Can I bring water from the desert? Yes! The Spirit of God says this is a day of new beginnings. Men have said numerically it could not be possible. God said forget about what men say I’m giving you a brand new start. I’m causing the earth to tremble. You say we don’t want to hear about trembling of the earth, God said it is only a sign that there is a shaking in hell and that heaven is about to celebrate the saints of the Most High God for the prosperity of the Lord that is about to come upon you. The Spirit of the Lord is working the miraculous. There is a supernatural intervention that is coming, for God says look to the sky. There will be a sign in the sky again over California, over Oregon, over Washington it shall continue north into Canada for the Spirit of God says this sign shall cause people to tremble and be afraid. Do not worry for the wind will come says the Lord. There is an experience that is similar to what took place on the day of Pentecost that is about to take place. What took place, the heavens opened up for they were united together, the day had fully come. The Spirit of God says the day has fully come. What day? The day says the Lord that you’ve been waiting for, the day of the Lord. Men shall say, shall we be caught away and be taken into the heavens? You are going to experience a different kind of rapture, it is a rapture that will take you into a new dimension of God’s authority and God’s power says the Spirit of God. Let there be no fear of this calamity for the Spirit of God says men I’ve told you there will be political upheaval and I will not take sides with any party in this nation, but I will rule with a rod of iron in this next election. This is will be a rod of iron and a rod of correction that shall come from My people and shall come from those that have been anointed and shall be known as the elect of the Lord. My elect are about to arise to the occasion and there is a baptism of fire that is coming to the people, get ready and rejoice says the Lord. The Spirit of God says, hear these words before you take your seat because you know it is not time to walk, it is time to run. Acceleration has taken place, your enemy has stood up against you like never before but the rod of correction it shall be upon this nation. No, not judgment, I said the rod of correction. What is this; would a father chastise his son without loving him? I’m about to show you the greatest love that I have for this nation and how I will take from the desert and bring oil, oil, oil and water says the Spirit of the Lord. There will be a combination, out of the water shall come the oil. They shall say why, why would these things happen? Because I own the earth. Watch the watermelon, for my prophet ate the watermelon today and there shall be a strange thing that will take place on the earth and they will say scientifically it cannot be correct. I’m seeing something very strange right now. God said they’ll say it shall contain no water because of such and such a place and such and such a thing. I don’t even know what I’m talking about, but geologically. God said I will prove them wrong, why because I created the earth. I know what to do and I know how to change it and I know what it can yield from the water will come the oil says the Spirit of God. Americarejoice this is your day. The Spirit of God says why do you wonder what has been spoken? Shall the prophets re-prophesy what has been prophesied before? No! The Lord has spoken who can but prophesy, you have to for I have sent My Word into the atmosphere, therefore prophets rise up, open your mouth and prophesy says the Lord. So there! We will prophesy for He has spoken. Who can but prophesy? A Lion has roared who shall not be afraid. God has spoken, prophesy! God wanted David to be acquainted with what was on the earth to use it against the enemy. If you could just catch what I’m saying to you right now. God saidAmerica you don’t need what they are providing for you. Out of your own soil you will destroy the giant of the Middle East. Your energy will come from sticks and stones, your energy will come from the water of the earth. God spoke tonight about the watermelon. Most of you are saying what in the world are you talking about? I’m talking about God sharing secrets. If you’ve got enough intestinal fortitude you’d say I believe if Moses could speak to the rock and it could bring forth water and you could strike the rock, then God can bring out energy from anywhere He likes, even a watermelon. Prophecy is something that allows us to do in order to break the power of prognosis. The spirit of prognostication is the most powerful influencing force on the earth at this very moment. Bad news, a relentless flow of bad news is causing the hearts of men to fail them and so we require an open heaven. There is an open heaven that is coming to us, the day has fully come. The Word of the Lord is, your day has fully come, therefore suddenly is about to happen and the heavens have opened up and something is going to rest upon your head. And there appeared to them tongues of fire and one sat upon each, one sat upon each of them, there is an expression that is sitting and resting upon each one of you right now. That day 120 people gathered in the upper room and were one accord, one place, one mind and suddenly, suddenly the house was filled with the sound as of a mighty rushing wind. There appeared to them tongues of fire and one sat upon each of them. I have read that so many times, but when I read that I realized that God has a unique expression for every individual in the house. In other words they were going to have an expression of God that no one else had. You have an individual expression that has rested upon you for the purpose of speaking and prophesying. The prophetic is you going to the future and brining it back. You bring back the presence of that event. You are a witness to an event that you are involved with and when you return you bring back the presence of that event called destiny. Kim Clement, from his website.